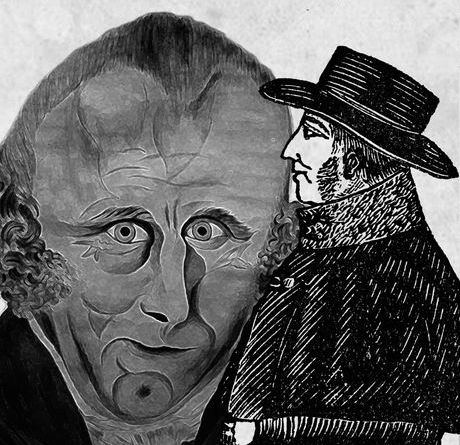 He is a rather stout man, about five feet six inches high, with light hair cut close, coming to a point in the centre of the forehead, and high above the temples, and has large bushy red whiskers: he is between forty and fifty years of age; and of singular manners. He usually wears a single-breasted blue coat, with a stand-up collar, and buttons covered with the same cloth; a black cloth waistcoat, and blue cloth trousers; half-boots laced up in front, and a glazed broad-brimmed low-crowned hat. Sometimes he wears a double-breasted blue coat, with yellow buttons. When travelling he wears a large black leather cape coming down to his elbows, with two pockets within the cape; across the back of the leather cape there is a square piece of dark-coloured fur, extending from one shoulder point to the other. At other times he wears a drab-coloured greatcoat, with a large cape and shortish skirts. When seen at York last Sunday, he had on the double-breasted blue coat, a common hat, and his greatcoat. 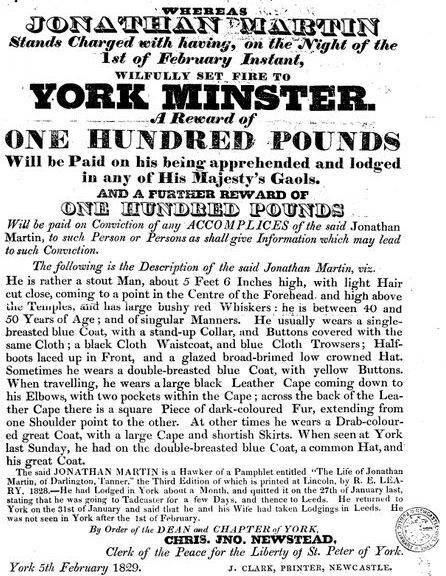 Following the failure of the search to track down Jonathan Martin in Leeds, the authorities drafted an advertisement offering a reward of 100 pounds for his capture which was heavily circulated throughout the whole of the north-east via all the region’s principal newspapers and on thousands of printed posters. 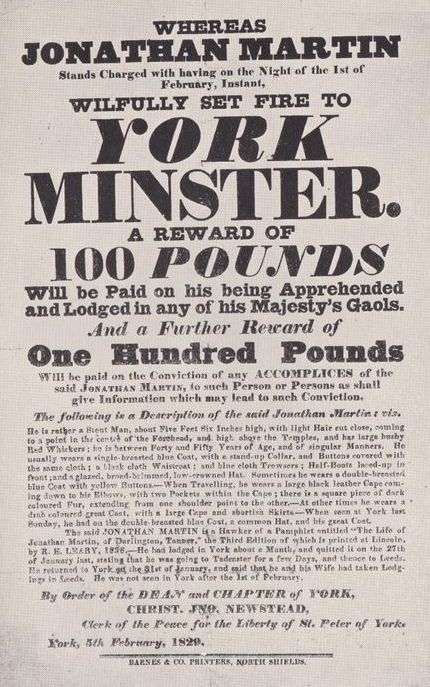 Jonathan Martin's wanted poster, 1829. North Shields: Barnes & Co.
Jonathan Martin's wanted poster, 1829. Newcastle: J. Clark.